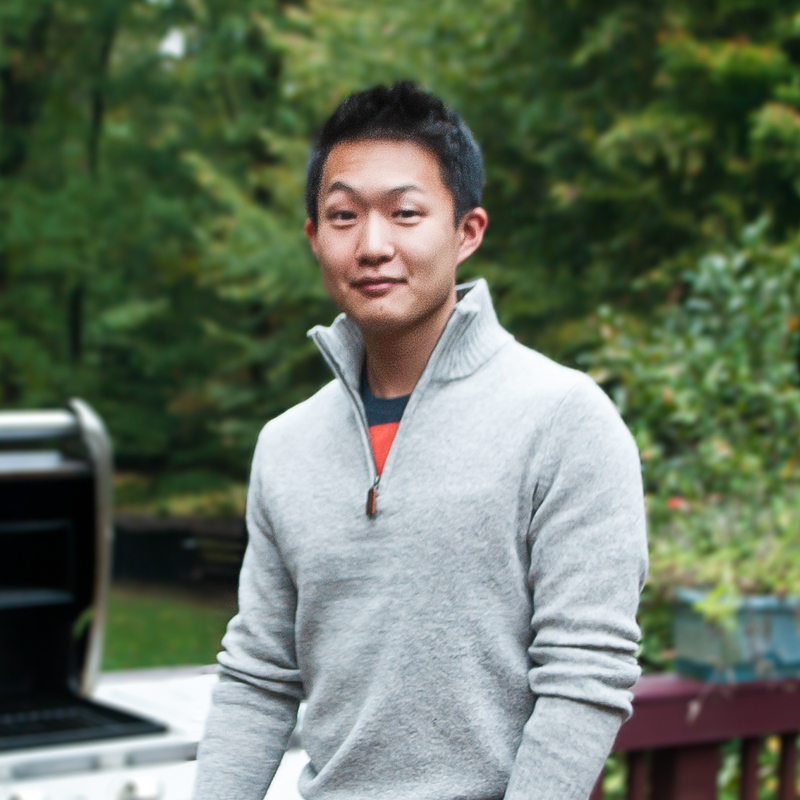 This is part three of a series of posts detailing the food I ate during an April 2011 trip to New York. See part one and two. 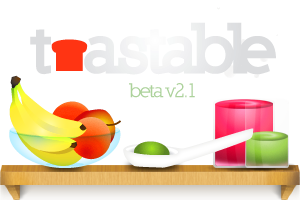 What better way to enjoy a Sunday than by eating brunch at a quaint, little café that serves up some of the most heart-warming comfort foods? Unfortunately for me, what was supposed to be a quick in-and-out turned out to be a long wait in line and an equally long wait for food. Luckily, the food, in the end, was superb. I’ve read many rave reviews about Prune from New York City food blogger Adam Roberts, so I finally decided to drop by the place and gauge its offerings for myself. It was a Sunday, so I thought there would be parking spaces available in Manhattan. I couldn’t have been more wrong. First, my mother and I spent nearly two hours circling around Prune looking for a parking spot, and second, the restaurant was preparing to close for brunch hours when we finally arrived. As a result, we were placed in a waiting list of about 10 people who were hoping to eat at Prune before the place closed for brunch. After another half an hour of waiting, we finally managed to get in, barely scraping past the brunch hours closing time and dining well into the period of limbo when the chef stops cooking brunch meals and instead begins prepping for the dinner rush.The saying goes that you get what you put in, and while that certainly felt true for the price of brunch at Prune—$19 for my entrée—the saying held doubly true due to the amount of time I spent trying to eat at Prune. My steak and eggs dish appeared so absurdly simple but packed an assortment of strong flavors and textures. The steak, Prime Newport grilled with parsley-shallot butter, hit my taste buds with salty savoriness like the cold, air-conditioning of a home after a long run in the scorching, summer sun. The seasoning, while largely composed of simple salt and pepper, carried a distinct layer of complexity from the light aroma of parsley. The liquified butter lay idle on top of the steak’s crunchy, blackened crust, tempting me to instantly devour it. 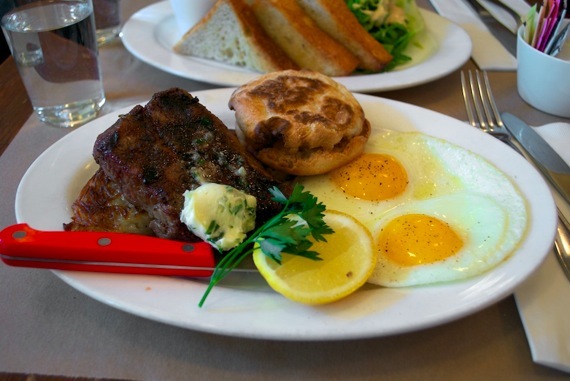 Beside the steak lay two sunny side-up eggs cooked to perfection and an English muffin with a stubborn crust. The muffin, to be honest, wasn’t that great. 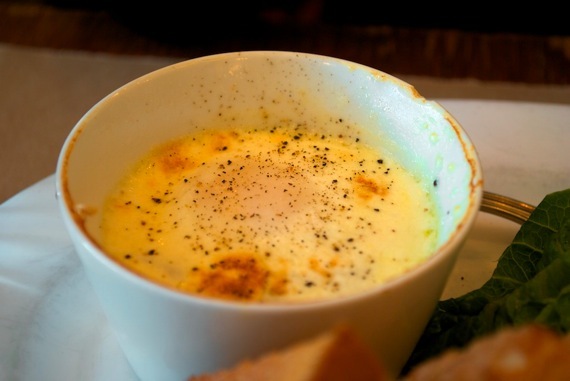 My mom, who ordered the eggs “en cocotte,” wasn’t completely happy with her dish, but my mom’s a very picky eater. Regardless, I haplessly tasted her dish and found the light, creamy coddled egg pleasing. Unlike the steak’s powerful flavors, the coddled egg with chicken bits harbored a more mild, soothing flavor. There existed enough flavor to even serve as a dip for the accompanying buttered toast but not too much so as to blow my senses away—a delicately balanced bowl of comfort. 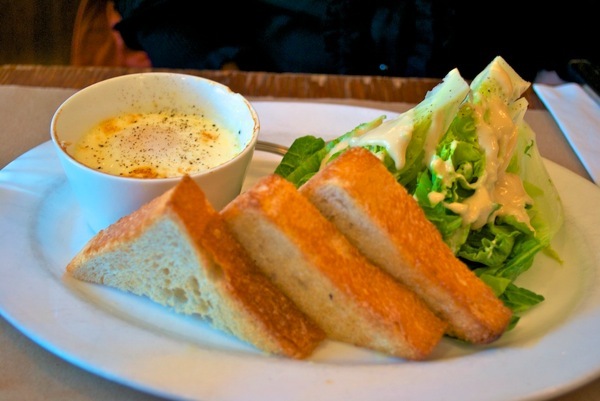 While the coddled eggs clearly stole the attention, a side of lettuce completed the plate.